I have a dear friend who has always admired my quilts. In fact, she bought my Charmed Stars quilt that I donated to a silent auction and it's now hanging in her daughter's room. When she moved in to a new house two years ago, I promised to make her something for her guest bedroom; she wanted a wall hanging to match the room's new bedspread and pillows. But time got the best of me and it took over a year for me to get back with her about the quilt. By the time I did, she had moved on from her new guest bedroom colors and decided she wanted something for her living room. This quilt is gorgeous, isn't it? It is a work of art, containing hundreds of hand dyed pieces. I decided to go for it; deciding I could imitate the effect with several different batik cuts. I had no batik's in my stash but I've been wanting to make a batik quilt for quite some time. This was the perfect excuse. I told her I couldn't replicate the quilt but it would serve as inspiration for whatever I made for her. The improvisational piecing didn't really worry me. I used the method I came up with for my Starburst quilt which basically means putting together a bunch of wonky blocks and laying them out and making more blocks to go in between. It takes a long time and it requires a lot of re-arranging and cutting and sewing. And the layouts vary based on the mood I'm in. But it's always fun and interesting. So I really enjoyed the process. The photo above is version 1 of this quilt. That's right, I made two different versions. After finishing the version #1, I wasn't completely satisfied with the end result. It was a beautiful quilt but it didn't follow the pattern of the original inspiration. 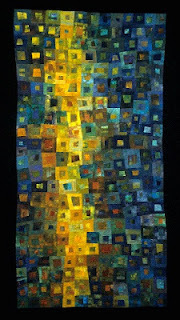 The yellow sort of ebbed and flowed throughout instead of making a line through the quilt with the blue along the edges. And since I had so much fabric left over, I decided to try again, thinking I would let my friend pick her favorite and I would keep the other one. I did some very heavy quilting in it. Version #2 ended up looking closer to the original quilt but my friend liked version #1 better so that's the one she picked. She made a great choice - it was my favorite too. Cancun Sunset #2 is still awesome though and it's currently in my sewing room waiting to be hung up. I'm so glad I challenged myself with these quilts. I spent hours and hours on them but I love the way they turned out. It will be a while before I tackle such an ambitious project again but I can't imagine making another quilt that is as beautiful as these. Here is the photo of Cancun Sunset #1, hanging in my friends living room. It's beautiful, eh?